Sticky Fingers, Green Thumb invites your imagination to travel out of the kitchen and into the garden. Almost sixty recipes celebrate vegetables, herbs and edible flowers in cakes and other sweet snacks. Tips on how to harness their unique flavours, prep them for baking and even grow them yourself will inspire you to create flavour-packed baked treats that aren’t loaded with empty gestures. Say goodbye to mushroom risotto and zucchini fritters and hello to porcini caramel and chestnut cake, and apple cider and zucchini muffins. This is earthy, seasonal baking at its best. Hayley McKee is a food writer, self-taught baker and owner of Sticky Fingers Bakery (established in 2010). She is known for her stunning cakes made with seasonal ingredients, edible native plants, and homegrown herbs and flowers. She is considered a go-to baker for bespoke baked creations that are big on flavours, not just looks, and has been named as the number one wedding cake designer in Melbourne. Hayley’s work has received local and international praise, and has been featured in international editions of Glamour, Rookie, Collective and I Heart. Her cakes and recipes have also been commissioned by Good Food, frankie magazine, ABC Radio, Warner Brothers Music, The Australian Ballet and fashion house Romance Was Born. 3.0 out of 5 starsGreat recipes but watch out for errors! This book has plenty of interesting, unique recipes. I've made the Honey for Ray cake and it was excellent. I don't know any other book that has these kinds of sweet recipes featuring savory ingredients, so this book is a definite stand out. The recipes are by no means healthy - tons of processed sugar and white flour. Seriously, one recipe has equal amounts brown sugar and white flour. That is an extraordinary amount of sugar (that likely could be cut). But most importantly - I have never been as mad at a book as I am at this one! I made the Heirloom Carrot and Pumpkin cake tonight. It calls for one 9-inch round. I need two 8-inch rounds, so I doubled the recipe, thinking I'd have a couple cupcakes left over. BUT NO - by "one" 9-inch round, she means "two" nine inch rounds, so now I have enough cake batter for FOUR CAKES. And, to be clear, this is an expensive (heirloom carrots! hazelnuts! A FULL BOTTLE OF GRAPESEED OIL FOR CHRISSAKES!) and time consuming cake. Between grating the carrots, chopping the hazelnuts (which you should toast, although the recipe leaves that out), and going to the store to get more hazelnuts, this monster took about three hours. I COULD HAVE CUT ALL OF THAT IN HALF IF THE RECIPE HAD JUST SAID TWO FREAKIN PANS! I'm sure the cake will be delicious, but I hope any future editions include better instructions! This is honestly one of the best cook books I've ever purchased, let alone baking. I have tried 3 recipes so far and all are just amazing. It's true desserts - not desserts trying to be healthy and failing epically. Lol. I'm truly impressed and in love with this book. Made me fall in love with baking in a whole new way. This is no ordinary baking cookbook because, in some ways, it’s really two books: baking and gardening. Since 2010 Hayley McKee, a self-taught baker, has been exploring the intricate nexus between these two subjects. Her Sticky Fingers Bakery was born from her desire to use natural ingredients to create desserts that “taste of nature.” After trying several of her recipes I can attest to the fact that she has created bold recipes that are honest and true to flavour. If I told you each recipe worked to use underused baking ingredients such as vegetables, herbs, or edible flowers you might scream “Gimmick!” at the addition of porcini to a cake or eggplant to a brownie. The honest truth is that she thoughtfully incorporates and pairs these ingredients in such a way that when you take your first bite it feels delicious, as though you can’t imagine how these ingredients for baked sweets were ever missed. What I really appreciated is the fact that, although vegetables are used, her recipes stay true the notion that a baked treat should be an indulgence. I can speak from firsthand experience that I’ve tried “healthy” brownies full of beet or sweet potato and they (usually) lack. I wonder: why even bother heathifying a baking recipe at all if the results are going to taste like you hate yourself or hate baking? Honestly if I’m going to go to the trouble of baking the end product has to be worth it. Worth the time. Worth the effort. Worth the ingredients. Just plain worth it. 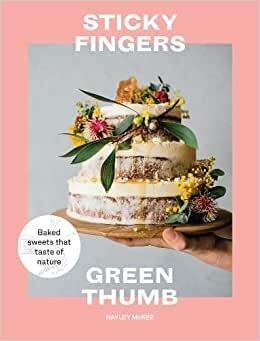 Making and baking recipes from Sticky Fingers Green Thumb I’ve found recipes which on one hand are beautifully indulgent but on the other look to nature, seasonality, and gardening for that beauty and indulgence. After her introduction the first part of the book goes in depth explaining and exploring how to grow, then use natural ingredients (first vegetables, then herbs and edible flowers), as well as imparting her baking “know-how” and giving novice bakers (such as myself) good tips and ways to troubleshoot (so instead of getting anxious the next time my cookies bake together on the sheet I’ll just get out the cookie cutter and make new shapes!) If you’re going to try your hand at baking I’d really stick with her advice of using a proper kitchen scale — it’ll really have a positive effect on the outcome of your baking projects! The remaining chapters on Cakes and Sweet snacks are full of interesting and enticing combinations. Although not a baking book focused on the specifics of the dietary needs of those vegan or gluten-free folk I feel like (at least with the recipes I tried) using vegan substitutes for eggs and dairy would work great with her recipes. Out of the the recipes I tried, I did make a vegan version of her Avocado and Pea Cookies by using a flax egg and maple flakes. The resulting cookies were wonderful! I quite enjoyed their pillowy texture (I think out of all the recipes I tried, these were my 4-year-old’s favourite!). All of the ingredients were relatively easy to source and while she suggests growing chamomile on the windowsill I knew I couldn’t wait that long so I improvised and just used organic dried chamomile from tea. Not knowing the counterfactual I thought that this cake tasted really amazing — delicately floral with the hint of white chocolate and an indulgent buttery texture. Many of the recipes included final notes on growing particular ingredients or just fun facts on some ingredients. Did you know that the avocado is nicknamed “alligator pear”? What I found with the five recipes I made is that each one had it’s own texture and flavour. For example while the Chamomile and White Chocolate Cake was luxuriously buttery and floral, the Coffee, Banana, and Zucchini Cake was moist and rich. Side convo here — let’s talk about this cake! People who know me irl know that I secretly rage against banana bread. I feel that it’s overused and unoriginal. No, that poor banana bread did nothing to me and I’m not picking on it but almost every recipe developer out there wheels out a “new” version leading to an absolute glut of banana bread on google. A googolplex of banana bread recipes? Oh probably. McKee’s recipe though is really inspired! The combination of the rich, dark coffee, sweet bananas, and moist zucchini is incredible — topped off with that butterscotch sauce and now you’ve got a “forever recipe.” I had a friend visiting over the weekend and even she was quite taken by this cake. It’s really special and totally worth making.